It was a miserable morning in a transcendent landscape. 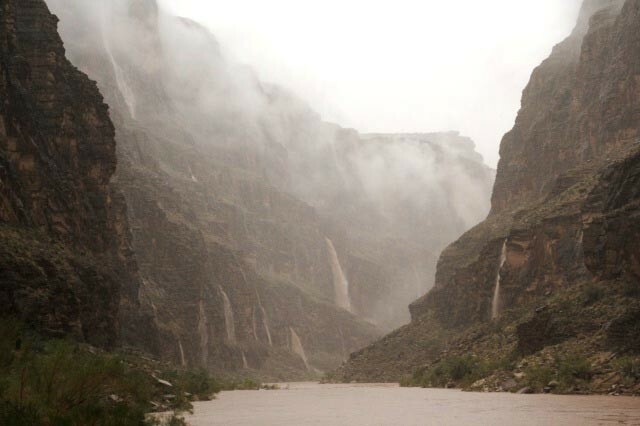 We huddled in the rafts under a steady businesslike rain, learning about all the leaks in our waterproof gear, while looking out and up to waterfall after waterfall, waterfalls coming freefall in 500 or 1,000 foot leaps over the great limestone walls in the lower Grand Canyon. Shifting convocations of mist, fragments of clouds drifted through and died against the walls; occasionally rocks rattled down the walls, startling us and plopping into the river; but mostly we just huddled stunned by the wet chill and that great gray dream of beauty as hours, miles passed and the waterfalls kept appearing around each turn and bend of the river till we were no longer amazed, and just wondered when or if it would stop raining – but not really hoping for that, knowing that the waterfalls would also stop. We'd been lucky that morning; we’d woken to a threatening sky, but managed to get breakfasted and all packed up and ready to go before it started to rain. We were one of those instant societies that come together for a couple three weeks in the Grand Canyon – twenty-some of us, under the guidance of half a dozen members of the tribe of boatmen (two of ours were women). Some of us were small clumps of couples and friends traveling together, but all of us had been strangers to most of the rest of us when we'd started from Lee's Ferry two weeks before the day of the thousand thousand-foot waterfalls. We were by then already well into the social sorting of genuines to be enjoyed, creatives to be followed, incompetents to be helped, arrogants to be tolerated, and the like, as we went with the river by day and a sandbar by night, setting up a movable feast every evening, ephemeral civilization at the bottom of the debris and chaos of ever-moving water, air and rock that is the Grand Canyon. I was officially there as a “boatman’s assistant” – thanks to Brad Dimock, a fellow writer and friend whose life has been intimately involved with the Grand Canyon for 35 years. “Assistant” meant I sliced and diced as prep cook, did dishes, hauled the groover, and otherwise made myself useful at our nightly civilization-on-a-sandbar. Beyond that, I was just a passenger, which was fine with me and everyone else – no responsibilities out on the river itself, thank god. But that morning – the rain began around 8:30, abrupt and hard, just as the boatmen were lashing the last drybags down. The groover was already aboard – a sure sign of imminent departure. But it was raining hard enough so they sent us back up the beach to wait it out, under an overhang because of possible falling rocks. We stayed there maybe 45 minutes, and watched the world change before us. Immediately across the river, we saw water begin to trickle in a little pinkish stream out of a notch 80 or 100 feet above the river, splash down onto a sloped ledge 20 feet above the river, then off that into the river. But the trickle began quickly to grow in size, and then we saw another fall start above that one, feeding into it, that second fall – what, 300 feet above us? 500? John Wesley Powell carried surveying instruments that let him estimate heights more accurately down there, but I just guessed, then discounted my guesses 25 percent because I prefer understatement to hyperbole. Meanwhile, within 15 or 20 minutes, the river changed: the translucent green water we'd floated on for two weeks became an opaque red slurry that was visibly rising as we watched. And our triple waterfall right across the river grew redder as more water came down; the top one stayed pink, but the one off the next lower wall turned red, and the one closest to us began to look like a great spill of blood – the thick brownish-red that blood is while it's still inside. Its volume – both quantity and sound – was huge and intense as it pounded on the bottom ledge; there was no further mystery about how water could carve rock down there, or more accurately, beat it to sand – although what pounded down on the ledge looked and sounded like something closer to mud than water. The rain eventually settled down to a steady but less imposing downpour, and the boatmen decided we might as well head on down the river. Just a quarter-mile downstream, Brad shipped his oars to take a picture; the boatmen have an “adopt-a-beach” program whereby they take pictures of the same beach every time they go past it, to monitor changes, and his beach was – he thought – just ahead. But after a minute he got a funny look on his face. “It's gone,” he said. He pointed out the place where it had been, his last trip only three weeks earlier; now it was gone, the last of it possibly washing out only a few minutes before we got there. So on we floated – Brad’s beach probably sifting along the bottom of the river below us – watching these incredible 500 or 1,000-foot freefalls of water off the rim. Some of them were red or pink, but many were the white and gray we expect waterfalls to be. What is it about a waterfall that is so mesmerizing? It’s something to do with the release, the letting-go that we mistake for freedom. And leaping down like these were, in 200, 500, 1,000-foot free falls – something to do with excess too, or maybe just extravagant abundance, all that potential energy being just exuberantly, flagrantly flaunted in sheer beauty. I do not know if there were really 1,000 of them; I didn't count; I was too busy watching them, and thus may have succumbed to hyperbole after all, a common problem in the canyons. Despite having studied and written about “the Colorado Rivers,” Upper and Lower, on and off for the past 30 years – mostly more political stuff – and having a deep abiding fascination with all of its many manifestations in the life of the American Southwest, it was my first time on the river through the Grand Canyon – the “Middle Colorado” – which makes me shy about writing on it, being just a tourist. Furthermore, it’ll probably get me thrown out of this broadshouldered magazine to confess it, but I didn’t enjoy the rapids. I’m not a water person – a sinker, not a swimmer; and getting whapped head-on by a few hundred gallons of cold water became a marginal idea of fun. Sliding down the tongue of every rapid – feeling the water pick up the raft the way the lift cable picks up a quad chair at a ski area, to carry us into a place where I couldn’t really believe the boatmen had much control over what happened – the only thing more rapid than the rapid was me rapidly praying to any god or gods lurking down there in the basement chaos of creation. Brad – who has been down rivers all over the Western Hemisphere – says the Colorado’s rapids are not “mean or angry”; they are just “big and jumpy,” but “angry” or “jumpy” is a pretty fine distinction when you’re sliding down one standing wave into a trough and looking up at the ten-foot thrashing wall of the next wave you’re either going to go up or through or some of both. I was lucky; we only had one close call where I found myself standing on one tube trying to push the tube on the other side back down from near vertical to horizontal. Then the standing wave stood down or something – I have no delusions about having successfully flattened it myself – and we were ejected from the rapid, minus our boatman who did get thrown overboard, more or less horizontal again with me sprawled in the bottom of the raft. I most enjoyed the long calm stretches where the river sometimes hardly seemed to be moving – and was in fact often moving back upstream in subtle eddies as much as downstream. The boatmen let us passengers row occasionally in those calm stretches, and I learned how elusive the current could be – a mere thread of water winding among back eddies and upwells and sinks. But mostly I was happy to just sit and watch geology and hydrology happen or not as we moved slowly through it all. The bigness of the Grand Canyon is obvious enough from postcards, and needs no further comment – it doesn't help descriptively to use more sesquipedalian synonyms: massive, monumental, stupendous, et cetera. “Big” is a sufficient descriptor for that most obvious quality of the Grand Canyon. But what gradually came to me after a few days was the fragility of it – fragility on a scale that boggles the comprehension. We would go past a piece of rock that had cracked away from a wall and slipped twenty feet or so, to sit partly in the water but still leaning against the wall – but the piece of rock was the size of a three-story building, and one wondered how far up the opposite wall the wave from its fall would have washed our raft. It is all falling apart, down there, but the parts are really big – although they do all end up as sand. The river moves the sand along – quickly in places, ever so slowly in others – and the eddies piles it up against the walls, and seeds blow in and try to anchor it, and boats full of people with luggage land there and create moveable civilization. But eventually it rains harder and longer than usual, or rocks roll around on the bottom and shift the current, and that stirs the sand and it follows the people on down the river. Everything is moving on through except for the standing waves in the river and the standing walls above the river. The really big walls the waterfalls spilled over are limestone; the Grand Canyon alternates thick layers of hard limestone with sloping layers of softer shales and sandstones, until you get down to the “basement” schist and granite of the inner gorges. At Lee’s Ferry, where most Grand Canyon trips start, the layer of Kaibab limestone emerges from under the sandstones of the Colorado Plateau, rising out of the river itself right there, then ascending as the river descends until within a couple days it is only occasionally visible thousands of feet above the river, capping the high plateau that bears its name. But the most impressive formation in the canyon, to this tourist anyway, is the Redwall limestone – the Redwall and Temple formations together that create the thousand-foot vertical walls over which poured the high falls we saw the day of the thousand thousand-foot waterfalls. The rain finally stopped about midday, and the sun began to break through the clouds. We all pulled over onto a big shelf of rock, and heated up some water for instant soup and tea to warm the innards as the sun quickly took over the task of warming up the outards. Rain gear came off, poly-pro dried out – and somewhere during that flurry of activity, the waterfalls stopped falling. And already, except for the blood tone of the river, it seemed more like something dreamed than something remembered. Who could believe a thousand thousand-foot waterfalls? Several people on our journey were on their second or third trip through the canyons. Brad stopped counting about fifty trips ago. But I am pretty sure my first trip will be my last. Mostly, this is because, like I said, I am not a water person. Everybody needs to find a geography that fits, and mine is the high valleys and mountains, where the streams are small and many. Brad Dimock’s is clearly the canyons; he is in all ways thoroughly immersed in the river in the canyon, knows its natural history and its human history; his stories from his own history in and with the canyon and its places and people greatly enriched the experience of being there for all of us. But another reason for thinking, now at least, that I don’t want to go back was the day of the thousand thousand-foot waterfalls. How could the river and its canyons and the weather, that eternal collision of earth air water fire, conspire or contend more magnificently than that? Accept the blessing; don’t push the luck; next time I’ll probably fall in. Published in Mountain Gazette, May 2009.